Hello Oh the Lovely Things readers! I am beyond thrilled and honored to be guest posting here on this beautiful blog today. It’s safe to say that when Clemence contacted me for this opportunity, I jumped on my couch Tom Cruise-style! I hope you enjoy this super simple, but show stoppin recipe as much as I do! Let’s get to it shall we? It's officially SUMMER, and you know what that means....peaches! 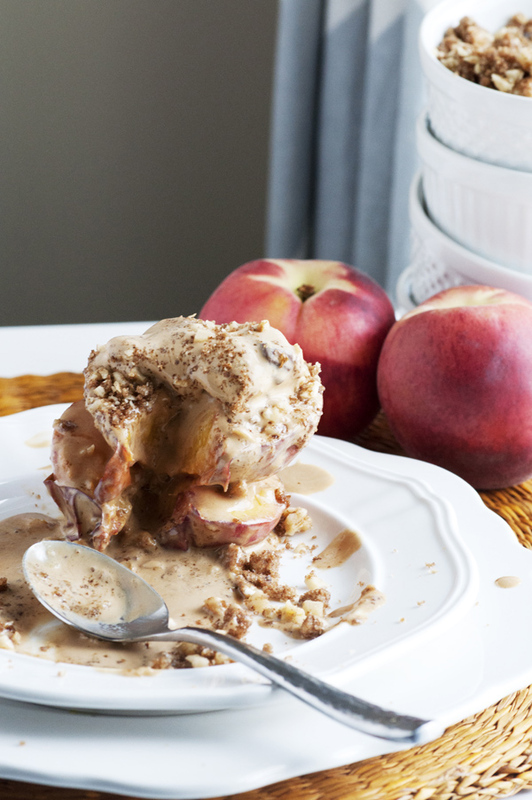 Today I want to share my go-to summer dessert - roasted peaches topped with salted caramel ice-cream and a brown sugar walnut crumble. This dessert is so easy and is perfect for summer parties or as an ending to a simple summer dinner. This recipe is so simple and starts with roasted peaches. If you haven't started roasting your fruit, jump on the bandwagon immediately! It's so simple and brings out all the flavors of your favorite fruit. Once the peaches are roasted to perfection, they get topped with the most delicious crumble made with walnuts, butter, cinnamon, and brown sugar. I'm convinced that brown sugar, cinnamon, and peaches should never be parted. After you try this recipe, I’m sure you'll be convinced of that too! After the peaches are roasted and topped with the walnut crumble the whole dessert gets finished with salted caramel gelato. You could skip the gelato or sub your favorite ice cream, but the salty caramel really rounds out the flavors of his dessert perfectly! 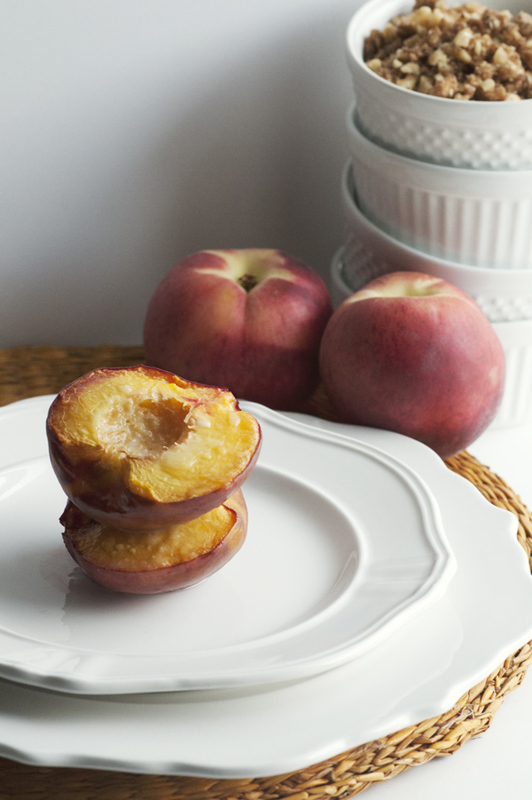 While oven preheats, wash and dry peaches and cut them in half. Carefully remove the pit and place in a large baking dish. Rub each peach half with coconut oil butter to ensure the flesh doesn't dry out in the oven. 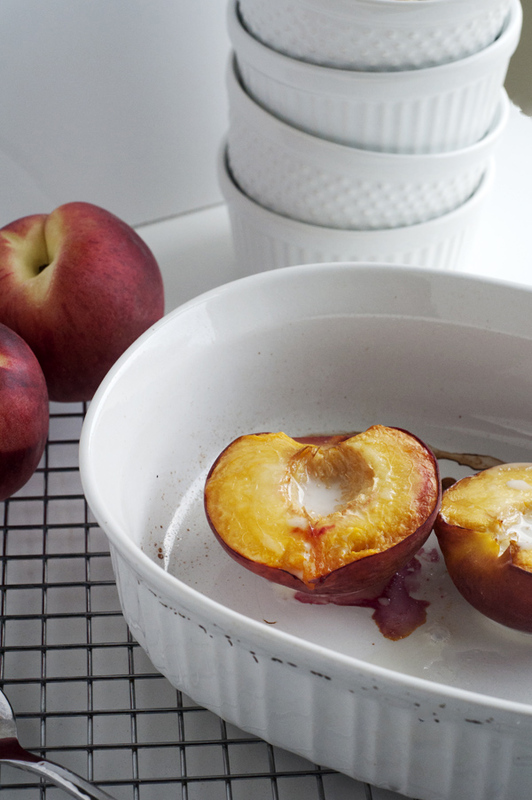 Roast peaches for 20 - 25 minutes or until soft and juicy. While the peaches roast, make the crumble. Combine walnuts, brown sugar, cinnamon, salt, and cold butter in a food processor and pulse until a crumbly. Pour mixture into a container with a lid and keep in the fridge until the peaches are done. Once peaches are out of the oven place one or two peach halves in a bowl, top with salted caramel gelato and a generous helping of the walnut crumble. * I love the subtle flavor that the coconut oil butter gives this dish, but regular butter would be fine too. Thanks for having me today! I hope you get to try this wonderful recipe and share it with the people you love the most! 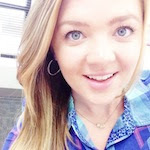 Meredith is the author behind the blog Lakyn + Judah. She can be found hovering over her food with a camera, drooling over the latest beauty products, eating lots of avocados, and running her favorite trails. By day she works with college students, but her true passion is leading people into the presence of God with music. Thanks for sharing! I was thinking on switching the caramel gelatto with vanilla ice cream. Have you tried? Wow. Those look so yummy. I gotta try that. Peaches are my favorite. This recipe was a pleasant surprise. 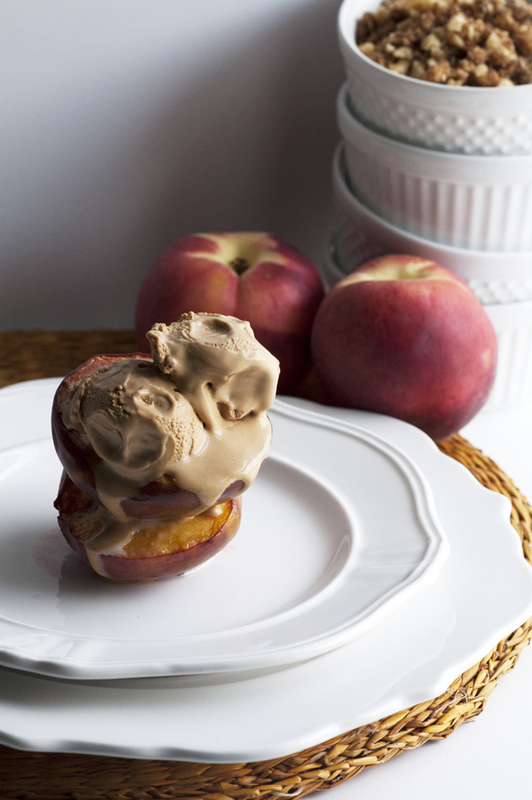 So easy to make -- no fuss, and brings out the best in summer peaches. Will make this again. It looks so delicious~~ Thank you for sharing!! Love it! In the game of thrones—in which, you know, you win or you die—the dice are heavily weighted toward death. Compounding the peripheral casualties of the big battles, the crumbling wall, the general chaos running rampant throughout the seven kingdoms, Game of Thrones’s penultimate season saw the tragic (and less tragic) demises of some major players: Lord Petyr Baelish, alias Littlefinger, after trying and (obviously) failing to turn Arya and Sansa Stark against each other; the dragon Viserion, felled (and then resurrected) by the Night King; Olenna Tyrell, who poisoned Joffrey Baratheon; Ellaria Sand, who poisoned Myrcella Baratheon; and all the seasons that aren’t winter. That’s right, ladies and gentlemen: Winter is really, truly here, and the game of thrones has finally been whittled down to its final contenders, who have aligned themselves into their final teams. In the last episode of last season, snow had just begun to fall on King’s Landing, and just seven episodes are left for Westeros to find a new ruler or else be overrun by the Army of the Dead. Let’s see where everyone stands ahead of the eighth and final season premiere, which airs on April 14.